Concrete Paver Sealer | Paver Sealer - Tile Tech Inc.
Sealing your pavements will help protect it, clean it and maintain its beauty for much longer. Concrete paver sealer gives your pavers a protective coating, so if you stain it with oil or grease, it is much easier to remove than it would be if your pavers were not sealed. So you can see that concrete paver sealer is the best way to maintain that new look to your driveways, patios and walkways. It leaves a clear gloss finish, making the color brighter, while repelling grease and oil stains. Sealing your pavers helps to promote durability, longevity and the overall aesthetic beauty of your paved areas. This type of sealer helps to protect your pavers by blocking the effects of water and other contaminants. 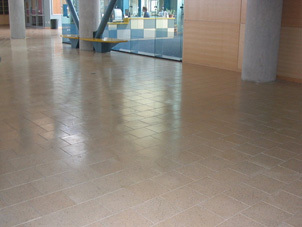 Film Formers generate a barrier on the surface of the pavers, often a gloss finish. This sheen finish also helps pro-long that new look color. This type of sealer actually penetrates into the pavers’ material, from 1 to 4 mils deep. These sealers are mostly used for absorbent materials, such as, concrete. Penetrants help to repel water and resist stain damage. Penetrant sealers also promote longevity and durability of the life and look of your pavers. Sealing agents can be applied to most types of surface pavement materials. 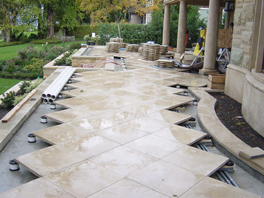 These include; concrete, slate, clay, granite, natural stone, stamped concrete and block pavers. You can apply sealer agents to your driveway, patios, balconies, surrounding the pool, terraces and car parks. Wherever sealers are used, the result is always a cleaner, brighter, long-lasting and beautiful pavement.